By Kay Tan in Social Media. Updated on November 18, 2017 . 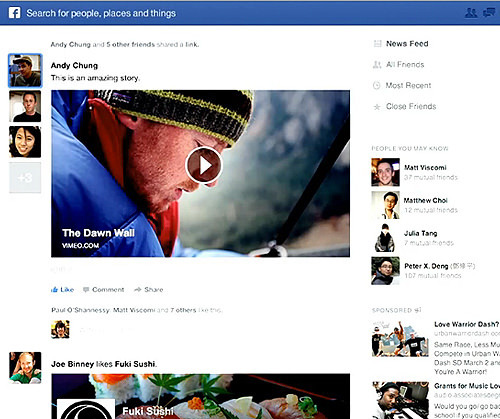 The New Facebook is about you. 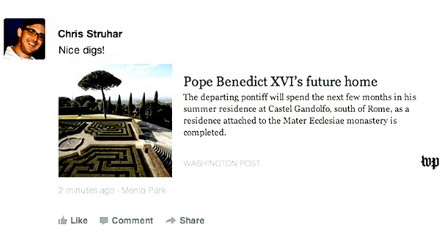 In a new attempt to manage clutter that is invading our personal feed on Facebook, Facebook is putting all your favorite feeds into one ‘personalized newspaper’ where you can get high quality content from famous figures, relevant local sources and your social circles. With the new design you can stay on top of a topic, or ‘drill’ into the essence of that topic – the new Facebook design allows you to dwell in both. It’s also taking tips from Pinterest and pushing for a more visually engaging interface, putting the focus on photos instead of just pure text. 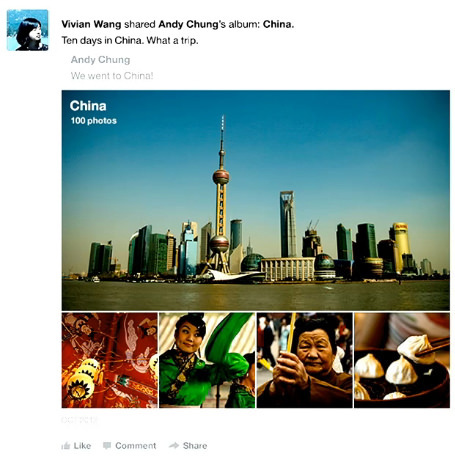 The new News Feed has been designed to give us richer stories, better choice of feeds, and a more consistent user interface between desktop and mobile Facebook. 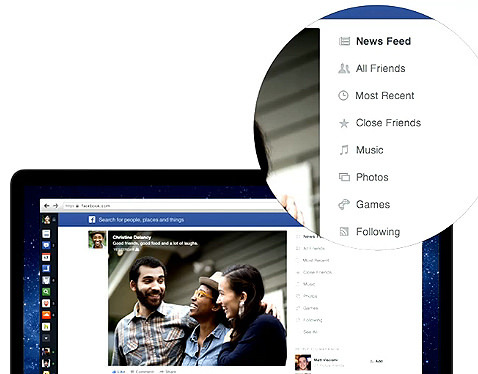 Here’s everything you need to know about Facebook’s latest News Feed redesign. The things that matter only take up 40% of the real estate on your current Facebook news feed. The new design puts importance on making the stories come alive. One way is via clearer, more stunning visuals with both individual photos and full albums. Article shares also got a facelift, giving it a more clean-cut, professional look. More of the summary is revealed and the logo of the publisher gets a bigger spotlight (it’s about time!). The information put into Timeline is now better displayed to outsiders, to help make connections. The profile photo is bigger and you can see mutual friends you have with this person, right from their Facebook cover photo. All the information you need to make the connection is at the same spot. The same is applied to pages, brands and services. With the new design, when you check-in into a place, you can see the place on a map with a description of the place, which is actually a great idea. Rather than depend solely on your friends’ descriptions, you get a clearer picture of what the place is and where you can find it. This effectively makes your friends’ adventures more relatable to you. Love Pinterest or Spotify? 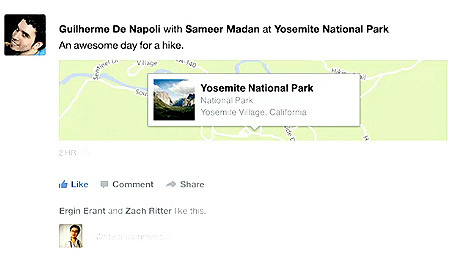 Facebook can help you track what you are doing there, giving your friends an idea of your activities outside of Facebook. It takes the repetitive work of sharing the things you do elsewhere with your friends in Facebook, and helps you curate all your actions into one feed for a more organized look. When an article or video is shared several times from different people, it no longer clutters your feed repetitively. We already have this in the current design but the new design lets you go into every single conversation that is attached to each particular share, sorted by your friend’s profile picture to the left of the article, or video, that is making recent headlines. Apart from articles and videos, you can also see all the postings from a single publisher, or headlines about a topic or public figure curated together for easier access. While this probably contributed to most of your clutter previously, it is now properly packaged into an easier-to-handle design. You can jump to the feeds using the switcher at the top right side of the new design. For mobile, this only takes a swipe down to find the feed you want. The Feeds Switch lets you get to the sections like how you do in a newspaper (like the sports section? Flip to the Sports section). With the new design, you can even create your own feed e.g. make a game feed if you are an avid gamer to get all the latest about your favorite games. The new design is bringing back an old friend. The All Friend feed makes a comeback and gives you the updates from everyone in your friends’ list in a single feed and in chronological order. Don’t worry, there is a separate feed for Close Friends so all that sorting will still come to good use. This gives music artists a great avenue to release their latest updates on Facebook, rather than do so with other less-populated social networks. Photos also get their own ‘section’, so you can look into the lives of your friends through their eyes, with help from their phone cameras and perhaps Instagram filters. If you follow Pages, these are all put together in the same ‘Following’ feed so that when you sit down and read, you are getting all of them on the same channel and in chronological order. If you tap into the Music feed often, this will automatically be ranked higher in your choice of feed based on your recent and frequency of interactions. Since you can create any other types of feed, this gives you better, more personalized management of the information you can find on Facebook. 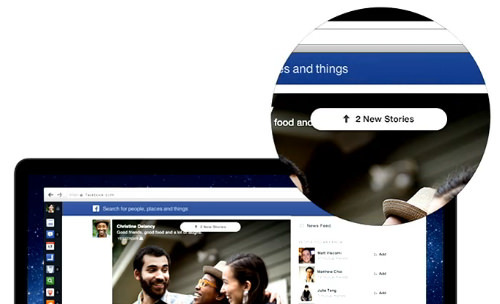 In an attempt to make Facebook look and feel the same across all platforms and screen sizes, the new design has a tray feature accessible on the left of your Facebook view. This is the same on the tablet, your smartphone and the desktop. 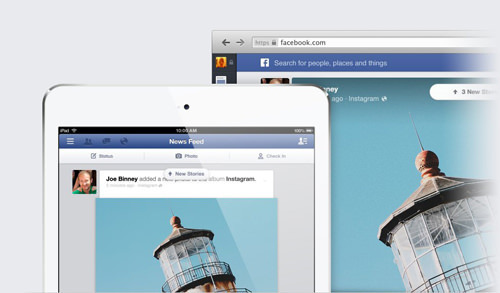 This reduces the need to relearn how to navigate Facebook whenever you access it from different devices. New notification about new incoming stories have also gotten a facelift in the form of a clean, bubble near the top of your feed. It lets us access new stories without scrolling off the page so you don’t lose sight of what you are reading. The new design is essentially mobile-inspired, and the physical model of how you got around in Facebook on smartphones and the tablet has now been ported to the desktop view. 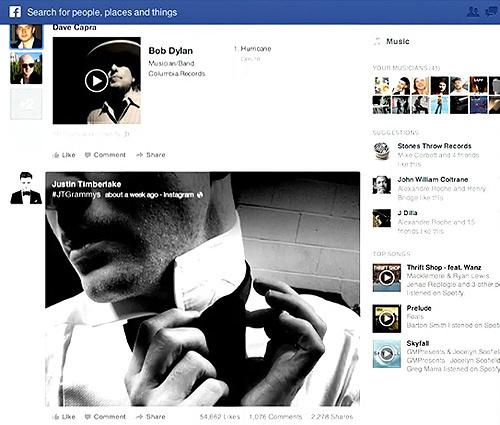 You can now access a page on Facebook from another page without having to go back to the homepage. Can’t wait to try the new look on? 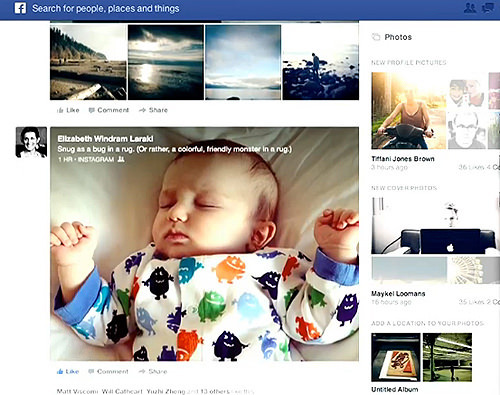 Join the waiting list and experience the new Facebook yourself.